What This Trust Quote Tells Us? It is the power of Trust Quotes that empowers us to exist and sustain in a world where there is no reliance left. Trust, without a shadow of doubt is the utmost quintessential virtue that literally forms the basis of anything positive in life. Whether on the personal front or professional one, there is nothing that can be built, created or maintained without the underlying fundamental of Trust. A Trust Quote above also underlines the same fact. Loss of faith, break up and rocky roads in relationships and the sheer lack of conscious efforts made for keeping relations alive, all of this happening around us in day-to-day lives because of the lack of Trust. It is very much the glue that binds people in relationships and members in a family truly stuck to each other in tough times. We are so drowned in our hectic lives to make sure that there is an investment in the bank for us, but hardly do we realize we are losing out on the investment of trust on the personal front. 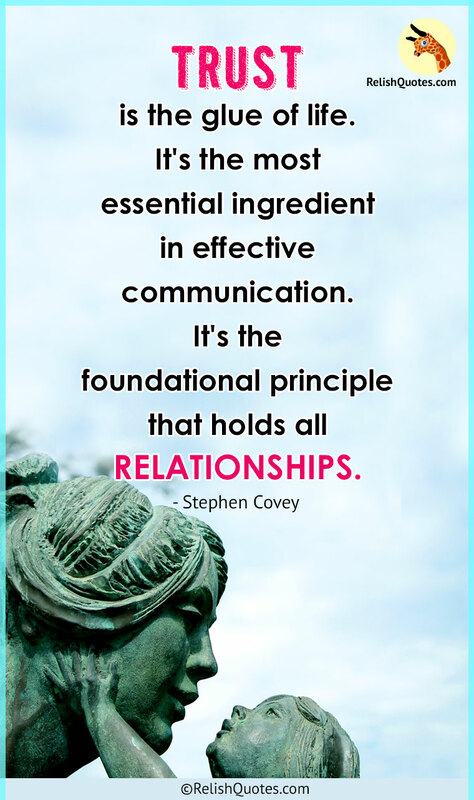 Even if you can speaking without any reluctance or hesitation and the medium of communication is clear too, till the time there is no blind trust and a bond of confiding in each other, you absolutely cannot expect harmonious relationships. Whether on the work front between your colleagues, or an employee-boss relationship, or at home, for a parent- child or inter-spouse relationship, it is the primary and utmost important asset of trust that holds the highest calibre in maintaining and sustaining in meaningful, lifelong and harmonious relationships. There is no alternative to this emotion called trust. You just cannot let go of situations and people in life, simply because your ability to trust others has been lost, courtesy to the endless number of backstabs you have faced, or applying the common blame of being bad to the whole wide world. That is just not possible. Not everything and everyone is wrong each and every time. You’ve got to be hooked on to trust, because today, it is trust that is fueling every relationship in the world.